Some countries are subject to natural disasters more than others, it's a simple fact of geography. Earthquakes, tsunamis, volcanoes, floods, landslides, fires… Chile has more than its fair share of most of those. Climate change is, of course, making some of them worse — especially the fires. The Andes have already seen immense, out-of-control forest fires through the first weeks of 2017. 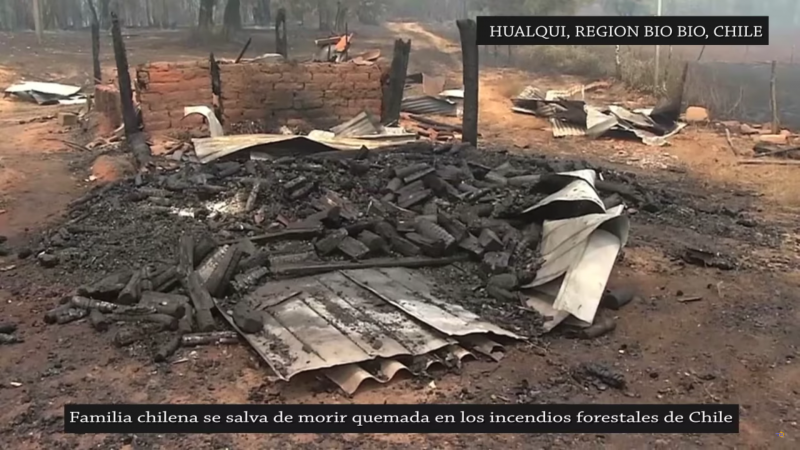 The southern hemisphere’s summer has featured the highest recorded temperatures in Chile’s history together with strong winds and human neglect, resulting in nearly 600,000 hectares of native forest and rural villages reduced to ashes. Eleven people, mostly firefighters, have also died. Even in the midst of a catastrophe, however, a story can emerge with the power to astonish. This time it was the experience of a family in a village called Hualqui near the city of Concepción. Silvana Garcia’s community was threatened by a massive fire that started in the country but moved steadily towards the village. Soon her husband Carlos was throwing dirt on the flames, trying to put out the fire as it approached their home. But it was like trying to cover the sun with a finger. How could they protect their home — and their daughters? Silvana was at the house and time was running out. But then she had an idea. She brought the girls quickly to the family’s well, fastened a rope inside it and let them down one-by-one into the three-yard deep chasm. She then prepared some metal plates, climbed in herself, and shifted the plates over the the well’s opening and climbed down the rope too. And there in the dank, dark hole they waited. While the house was burning to the ground outside and temperatures were reaching over 1800°F, the mother and her children huddled in the humid gloom of the well. They were there for two hours. Meanwhile, Carlos had evaded the flames as well. Once the fire had moved on, he returned to the house to find nothing but ashes. He looked for his wife and daughters with increasing panic. Then he heard noises coming from inside the well. When he approached it, he removed the cover and to his enormous relief discovered what his wife had done. He helped them all to the surface where they too could finally witness the devastation. Their house was burned to the ground, but that wasn't all — the farm and all its animals had also succumbed to the fire. It was a disastrous event but the family could at least be grateful that they had all survived. Silvana, Carlos and their children will never forget the loss they suffered and they know that now it’s time to face the future and get on with their lives. It won’t be simple but at least they have each other and can rebuild their lives hand in hand. Here’s to the people of Chile affected by these fires and the recovery effort they’re facing. Let’s hope they get the support they need and that governments everywhere start taking the threat of climate change seriously!